Air Force Ret. Maj. Gen. Halloran is one of one of only 10 pilots in the Air Force who flew operation missions in both the U-2 and SR-71 high altitude reconnaissance aircraft. For a man who flew harrowing combat missions during the Korean War and piloted the latest and greatest of the nation’s spy planes during 34 years in the Air Force, it seemed odd that an accident during a casual morning walk in Colorado Springs would ground him. Air Force Ret. Maj. Gen. Pat Halloran, 90, a legend in flying circles, mixes the story of his adventurous life with a bit of quirky Irish humor. A Minnesota native, Halloran never dreamed as a young man that he’d end up as a decorated pilot, one of only 10 pilots in the Air Force who flew operation missions in both the U-2 and SR-71 high altitude reconnaissance aircraft. The SR-71 is a lightning-quick aircraft that cruised at a speed of 2,000 mph and an altitude of 80,000 feet. The aircraft set a record from New York City to London in one hour and 51 minutes. After graduating from high school in 1946, Halloran aspired to become a music teacher. A drummer in several bands, he attended MacPhail Conservatory of Music in Minneapolis when his mother called one day and told him he’d been drafted. Halloran figured he’d serve a couple of years and get the GI bill to pay for the remainder of his schooling. It would all work out, he thought. 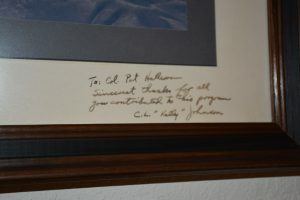 Both of his brothers had served in the U.S. Army during WWII, and Halloran intended to serve in the Army, too. But while waiting outside the office of an Army recruiter, Halloran’s fate forever changed. Ret. Air Force Maj. Gen. Halloran flew more than 100 combat missions in F-84 fighter jets over North Korea in the early 1950s, and when a photographer showed up at one of the air strips, a photo of Halloran and his buddy appeared on the cover of Newsweek magazine in 1951. “This guy, he was wearing the new blue uniform. He was a good-looking guy with a band of ribbons,’’ Halloran said. “He asked me if I wanted to be a part of the Aviation Cadet program and become an officer and a pilot. I had never been on an airplane in my life but 20 minutes later, I had signed up for the Air Force. It was a total freak switch. 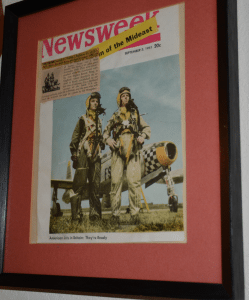 Halloran flew more than 100 combat missions in F-84 fighter jets over North Korea in the early 1950s, and when a photographer showed up at one of the air strips, a photo of Halloran and his buddy appeared on the cover of Newsweek magazine in 1951. During his nine years with the U-2 program, Gen. Halloran flew missions from nearly a dozen forward operating locations overseas and accumulated more than 1,600 flying hours in the high-flying reconnaissance aircraft. In December 1965, he was assigned to Beale Air Force Base in California and became one of the first pilots to fly the SR-71 aircraft. He flew the U-2 over Cuba and the SR-71 Blackbird and the U-2 over Vietnam. He was appointed commander of the 1st Strategic Reconnaissance Squadron and later served as deputy director of operations for the 9th Strategic Reconnaissance Wing. He progressed through a number of high staff positions with a final assignment on the staff of the Joint Chiefs of Staff in the Pentagon. “I was just getting the hang of it when they said ‘time’s up.’ ’’ Halloran said. 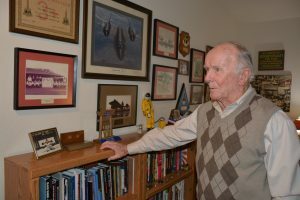 After he retired from the Air Force, Halloran spent two years flying around the United States looking for a place to live. When he found a townhome at the base of Cheyenne Mountain in Colorado Springs, he knew he’d found a place to call home. 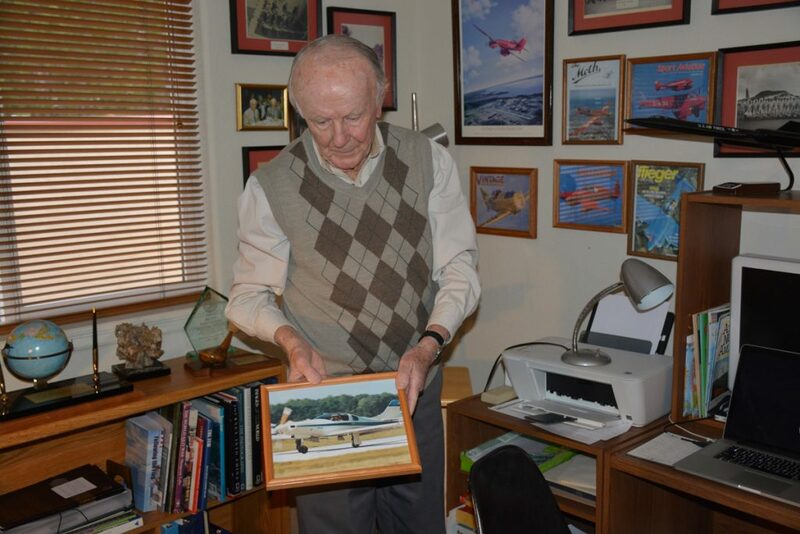 He turned an office in the new place into a mini-museum with old black-and-white photographs, aviation books, models of the airplanes he has flown and the cover of Newsweek magazine from 1951. He became a regular at air shows, and had annual speaking gigs at the legendary air show in Oshkosh, Wisconsin. He kept in touch with Kelly Johnson, an aeronautical design and engineering genius from Lockheed, who is recognized for his contributions to a series of important aircraft designs, most notably the U-2 and SR-71 Blackbird. He flew his experimental kit airplane often from Meadow Lake Airport, east of Colorado Springs, traveling often to see friends throughout the United States and attend Air Force reunions. He took walks daily to stay healthy and last June 22, what he calls a “day that will live in infamy,’’ he was struck by a car while walking across Star Ranch Road and Highway 115 intersection in south Colorado Springs. Air Force Ret. Maj. Gen. Halloran’s home office is decked out with military memorabilia and books about flying and leadership. Halloran floated in and out of consciousness. He remembers people hovered over him while he lay in the street. One woman held his head in her hands and offered words of encouragement. An ambulance arrived and rushed him to UCHealth Memorial Hospital Central, where southern Colorado’s only board-certified fellowship-trained orthopedic trauma surgeon, Dr. Peter Fredericks, was waiting. Maj. Gen. Halloran had a punctured lung, nine broken ribs, a broken clavicle and serious injuries to both hips: bilateral acetabulum (hip socket) fractures. Fredericks, who is known for patching people back together who have suffered multiple injuries and severe trauma, did a total hip replacement surgery on one hip with the help of Dr. Dennis Phelps and fixed the other hip in a separate surgery by placing three screws and a plate. Halloran spent three days in the Intensive Care Unit – days that he says were ‘pretty fuzzy’ before he was moved to a live-in physical rehabilitation facility to learn how to walk again. While in rehab, he lost 20 pounds. “I was on so many medications, I couldn’t eat anything. When he got back home, where he lived alone, he was not able to drive and could barely get around. A longtime friend moved in to his home and took him to outpatient rehab and doctor’s appointments. “He really saved my bacon,’’ Halloran said. Eventually, though, he recovered enough to walk four miles with a walker; and then progressed to walking 1.5 miles with only a cane. A friend sent him an Irish shillelagh walking stick, a gift that he cherishes. By November, he was able to walk on his own, without a cane or assistive devices. Over the years, Maj. Gen. Halloran kept in touch with Kelly Johnson, an aeronautical design and engineering genius from Lockheed, who is recognized for his contributions to a series of important aircraft designs, most notably the U-2 and SR-71 Blackbird. “I feel like I have really progressed a tremendous amount,’’ Halloran said. Before Thanksgiving, he went to Meadow Lake Airport. Two of his fellow pilots helped him get up on the wing and into the cockpit of his plane, and he took off for the skies, taking in the iconic sites of the Pikes Peak Region — Garden of the Gods, The Broadmoor Hotel and the Air Force Academy. It was so nice, he said, to be airborne again – back in the saddle that made him a legend in the sky.